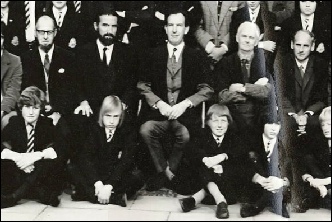 This section of the website is designed to include information about each year at Farnham Grammar School and Farnham College from September 1971 through to July 1978 and the "Great Escape". Material is being collated for later years, whilst further contributions gratefully received! You may also like to visit the General Gallery. 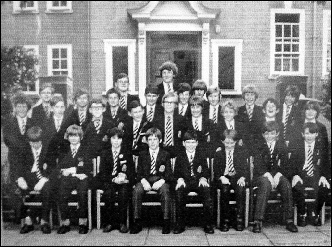 Includes this fine portrait of Form 1P, the full “new intake” list for 1971, and contributions for The Farnhamian. Includes the School Photo of 1972. This extract shows “Chin” Evans, John McLaughlin, Paul French, John Wills and Peter Larby, above Paul Hobbs and Paul Slinger. The Great Change! Girls! Teaching at Menin Way and Morley Road! Sixth Form expanded as Farnham College comes into being - the first Sixth Form College in Surrey. The College Calendar is reproduced in full for this year. It shows that the production for the end of the Autumn term was The Taming of the Shrew. Other highlights of the year included the Alpine Village trip, the Russian trip ("Is Len In? "), and the cruise of the SS Nevassa ("Any more people for the cruise?"). Sports fixtures appeared in full on the reverse side and have been reproduced in full. The trip to Berlin, a "5th Year return to College 1.45pm with books", and the "At Sixes and Sevens" Introductory Course in July. The fixtures for the Summer term of 1976 have been reproduced from the Summer Term's calendar, along with the summer of ‘76 year photo (click on the image to view a larger version). Oh yes - and the O level exams. 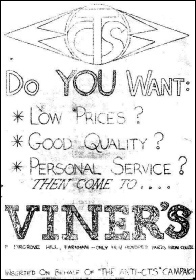 Includes material on Chris Nelms’ £1 solar heater, adverts for the “Anti-College Tuck Shop Campaign” and the visit to the site of the Battle of Cheriton. 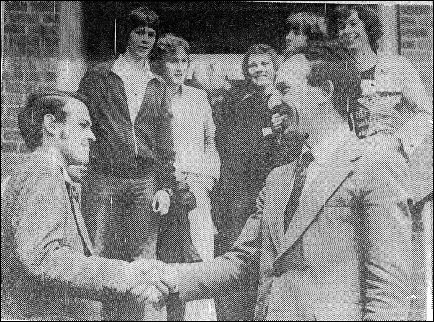 The elections for the Staff-Student Consultative Committee (the photo shows the successful candidate being congratulated by Paul French), A Level exams, "Farnham 400" (1578-1978), the Leaver's Dinner. A separate page has been added regarding the "College Copse" in Farnham Park - an enduring reminder of the Farnham 400 anniversary.